I have always been the strong one. I have been through many challenges and overcame. But we all have bad days or times, people just don’t expect the strong ones to have them. In a way, it is another box people try to put you in. “You are a strong person so you do not get to have bad days.” They say it without saying it. People who work in what is called the helping fields especially do not get to have bad days, and that is what causes burn out. Teachers, Police Officers, Nurses, Pastors, Social Workers, they give so much to so many people, but they do not have anywhere to turn when they need help. People in these fields also have to be careful about showing vulnerability because they do not want to appear weak. But I am a very transparent person and my gift and purpose is to share with others. So, today I am sharing my vulnerability. That doesn’t make me weak, it makes me human. The holidays tend to be a tough time for me. I lost my first daughter in November of 1995. It will be 21 years this year. God has given me healing, this is true. But that doesn’t mean it is completely gone. It isn’t crippling anymore, but it is still there, an ever presence. I remember when I first lost my daughter, a mother who had also experienced the loss of a child told me, you will never get over it, but you will learn to live with it. That has been my experience. I learned to live with it. One child cannot replace another, but having my daughter Imani provided me with comfort. I believe that is why God made her such a good girl, because she is like a living present from God. So, that is the other part of what makes the holiday’s hard as a single parent is providing for her. I am grieving over one, and struggling to provide for the other. I want her to have the best, and I have done whatever I had to over the 14 years of her life to do just that. This is a motivational blog, and some may wonder what is motivational about this topic? Honesty. That is motivational. Sometimes people need to know they are not alone in their struggles. It isn’t about “misery loves company” or “a pity party.” Misery and pity are negative, the mission is to draw people in, pull them down, and keep them there. However, honesty and transparency are giving, empathetic, and the goal is healing. Do you know how many people I have heard say they thought they were the only person in their challenging situation. When you are an abused child, you think you are the only one. A battered wife thinks nobody understands. An employee facing sexual or racial harassment feels trapped and isolated. People in helping fields often feel overwhelmed but cannot express it for fear of appearing weak. What do you do when you give so much to others, but when you request help you can’t or don’t get it? I had this experience recently. I requested help with a current goal, but I didn’t receive it. Then I immediately went right back into help mode for other people. And guess what? I’m not going to stop! I am going to go right on helping other people, because that is my purpose. My reward comes from God. He has always provided for me, and I know He will continue to do so. That comes with being the strong one. I keep it moving. God blessed me with a strength that not everyone has. I can take a lickin’ and keep right on tickin’. But just because you keep on tickin’, doesn’t mean the lickin’ didn’t hurt. Give your Pastor a break sometimes, he or she is one of God’s shepherds, but they are not perfect. Show some love to a Police Officer. We are in the face of a racial uproar because of the racial profiling that is rampant in our country. But not ALL officers are racist. If you see one that is doing good, encourage them today. They face situations on their jobs that the average person has no idea. Say a positive word to your child’s teacher. They have to teach a room full of little monsters lol! Teachers face challenges with children that are very stressful. Overcrowded classrooms, not enough supplies, children with extreme behavior problems, and parents who act worse than the children. Give a Social Worker a hug. They take on the problems on their clients while also solving their own problems. Please remember Police Officers, Teachers and Social Workers are vastly underpaid. They are finding resources for others while they themselves are in need. All of these people are human. In essence I am saying remember their humanity. Don’t hold them to unrealistic standards. 1. Remember that people in your life who are the strong ones have bad days too, so give them a break sometimes. 2. If you are one of the strong ones, know that you are not alone. Don’t let the world put you in a box where you can’t have a bad day, or period of time. 3. Tears do not make you weak. You can cry, feel disappointed, or be frustrated for a minute and still be the strong person that God made you. The key is to not stay there. We can cry and get right back up the next day and keep it moving. I will end this post with a song that is very inspiring to me, “Encourage Yourself” by Donald Lawrence and the Tri-City Singers. And no matter how you feel, speak the word and you will be healed. Sometimes you have to speak the word over yourself. Depression is all around, but God is a present help. The enemy created walls, but remember giants, they do fall. Oh as I minister to you, oh I minister to myself. Life can hurt you so, ‘til you feel there’s nothing left. No matter how you feel, speak the word and you will be healed. Speak over yourself. 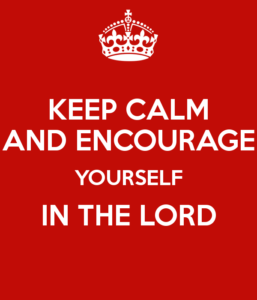 Encourage yourself in the Lord.